Without a contact us page anyone won't be able to have a complete website. All the internet users worldwide use contact us pages to connect with website owners for different reasons. There are several methods that websites use for "contact us" pages. Real-time messaging is a great approach for this. But, it costs more. So, still, many websites use the email method which we are going to discuss in this article. The Email Method is very simple to understand. First, we will have a page that basically has two input fields for email and message. The user should enter his email and a text describing his thoughts/needs in these input fields respectively and submit the form. Then, we send an email to an email address that you own like [email protected] or [email protected] This email includes the header Reply-To with the value of the user's email. So, you can easily reply to the user using your email service provider. Let's start! First, we gonna plan it. Here's the HTML code I'll be using. Use the POST method and empty action attribute for the form element. (Empty action attribute will say the browser to submit the form to the same page). If you are not familiar with using forms in PHP, I recommend you to follow our complete tutorial on PHP forms. Our form has two input fields. First one is for the email of the user. The second one is a textarea which lets the user type a long message. We have already created the HTML page. 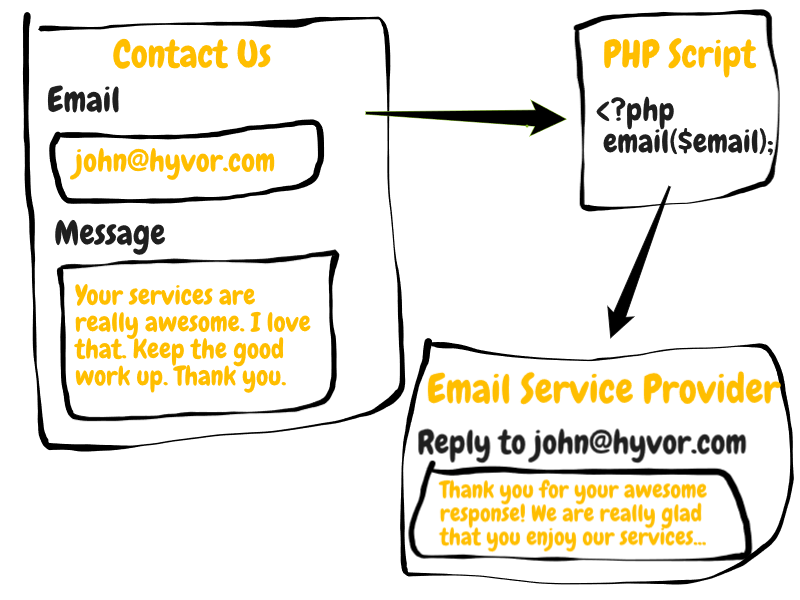 To make it live we should add some PHP code to send an email to our email. Let me remind you our procedure again. First, the client submits the form. Then, we get client's email and message. Next, we send ourselves a beautiful email including the user's message. Important: In this email, we include a header called Reply-To. It is set to the client's email. Because of this header, when we reply the email will be sent to the client's email. Thereafter conversation should be continued through emails. Let's look at the PHP code. Normally keeping the PHP code and HTML in the same page is better (but, not required). Here I'll keep both codes on the same page. I divide this into 4 subtopics. It's pretty easy. As we are using POST method for the form submission, we can always use the following code to check whether the HTTP request is a form submission or not. When we enter a link into the browser, it sends a GET request to the server by default. So, if the request method is POST, the client must have completed the form and submitted. But, we are not 100% sure as someone can use terminal or software to send POST requests. In this case, we really need the next step to validate whether all the data is there. In this step, first, we check whether all the required data is set. If they are empty we store an error message in a variable to use in step 5. If they aren't empty, we assign them to variables. Then, we validate them. If they fail the validation we store an error again. (If you wanna learn how to validate inputs, please read our tutorial on it. First of all, we need to check whether there's no error. First, we should generate the current date with PHP. Now, we have the date in $date variable. Let's create the template. In emails, settings headers are really important. $headers = 	"From: Contact Form <[email protected]>" . "\r\n" . "Reply-To: $email" . "\r\n" . FROM header is not so important in this case. Use anything you need. REPLY-TO header should always be set to the user's email. Last two headers say that it is an HTML email. Now we can send the email. If the mail was sent successfully we set $sent variable to true to use later. We have two variables ($emailError and $messageError) which save error messages on failure. Let's add a code to display the error if exists. Add this code to the bottom of your page (before the </body> tag). To learn more about how to use PHP in HTML please refer to this tutorial. Finally, we can add code to show the user a message that his data was submitted successfully. Everyone likes beautiful websites. This is an example that how you can style your form. You can improve this according to your ideas. This is the CSS code I have used. $headers = 	'From: Contact Form <[email protected]>' . "\r\n" . Finally, if you are interested in a premium contact us form, I created one. Check it on Codester.